History of Search and Rescue dogs - Peace River K9 Search and Rescue, Inc.
Peace River K9 Search & Rescue maintains many Certified K9 teams to serve its community. Not all SAR dogs are trained the same way or serve the same functions. Therefore, it is necessary to familiarize yourself with the different types of training provided to SAR working dogs so you can decide which type of canine needs to be deployed. Deploy The Tracking Dog or The Trailing Dog? 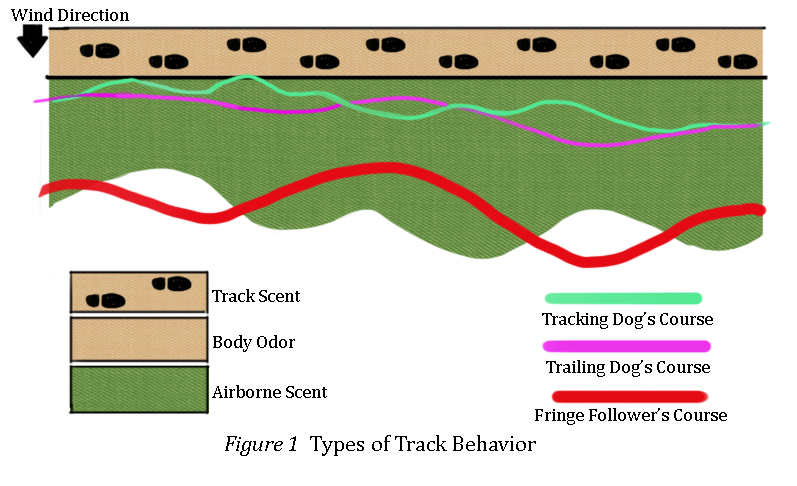 A true foot step Tracking dog follows “ground disturbance odor” in vegetation and/or dirt sedimentation from the track start to the location of the victim. They are not trained to locate and identify human scent but rather the odor created when the human foot disturbs the ground surface. These Tracking dogs are sometimes referred to as footstep trackers because of the exhibited behavior of moving slowly from footstep to footstep with a deep, nose down attitude. Hence, their nose staying directly on the footsteps left by the human. Some of these dog are trained to indicate articles left on the track and the search manager needs to know if this dog is trained for that. Since these dogs are not trained to be scent specific, trackers are limited in their ability to follow the track in heavy contamination and struggle over cement or asphalt if not properly trained. Trailing dogs follow “specific human scent”. They are less concerned with ground scent or other surfaces and more concerned with the specific scent they are presented. They are normally given a scent article of the person they are expected to trail. Because they are trained to follow the scent presented, they have the ability to work in heavily contaminated areas including urban environments and eliminate competing scents that bear no significance to the scent article. Many refer to trailing dogs as Scent Discriminating or Scent Specific dogs. Some Trailing dogs are trained for scent specific article finds ( articles that have the missing persons scent on them) and will indicate on those articles. How does the Search Manager know and understand the difference in these type dogs? A brief historical perspective might be best in order to explain. In the early 1900's, there were two schools of thought that developed in Europe. At that time a German named Freido Schmidt began the first serious effort to understand how dogs track and if human odor was reliable and could be used as evidence in court. Through his efforts many discoveries were made in regards to tracking dogs and finding human odor where ever it presented. His belief was that it was impossible to leave an odorless human track, Human odor was transferable and trained K9's could follow it. His research lead to many Military dog uses of the K9 including the development of the Messenger K9 that was trained to follow a chemical scent track from one trench to another during World War I. 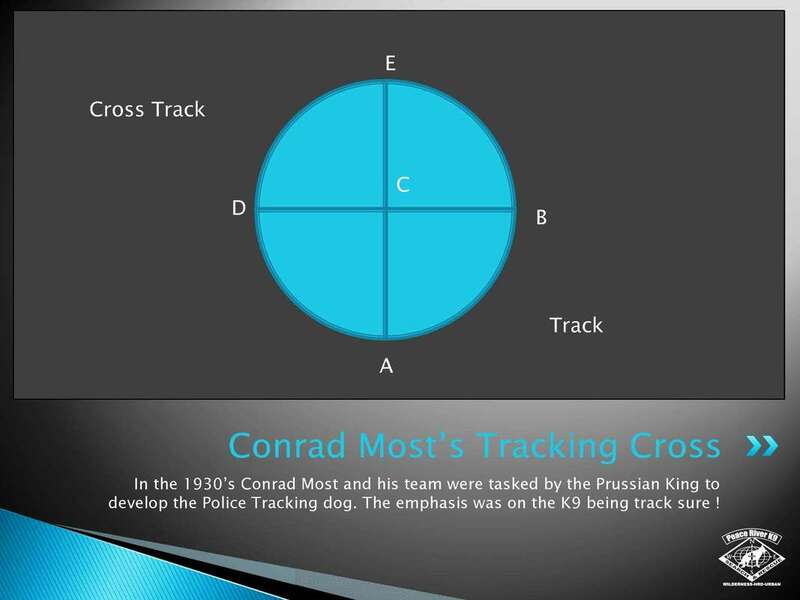 The Prussian King was so impressed with the work of the scenting K9 that in 1930 he tasked a researcher and trainer by the name of Konrad Most to develop a reliable Police Tracking K9. He along with an assistant named Todd Boetcher would set their course for about 40 years of research on Tracking dogs. Their initial beliefs were that odor was transferred at the human point of contact with the ground or foot step. Over the next 10 years Most experimented with different shoe types, cross tracks, aged trails and the development of the Trackers cross which is still used to this day along with specialized equipment and harnesses for the K9. However the two schools of thought (those that believed in transferable human odor and those that believed the foot step was the source of odor) would collide as their lively hoods were in jeopardy (selling dogs to the military and police was lucrative then as it is today) and a challenge was in the works. The purpose of the challenge was to determine if there indeed was a difference between trackers (ground disturbance) and trailers(scent specific). It is reported that it was conducted with over 1000 dogs but this could not be verified. A wooden wheel with shaped feet, wooden and porcelain, was constructed and attached to a track mechanism that moved it across the ground. The track was adjustable and the depth of the foot track could be set as well and the elevation of the footstep where no contact could be made with the ground. 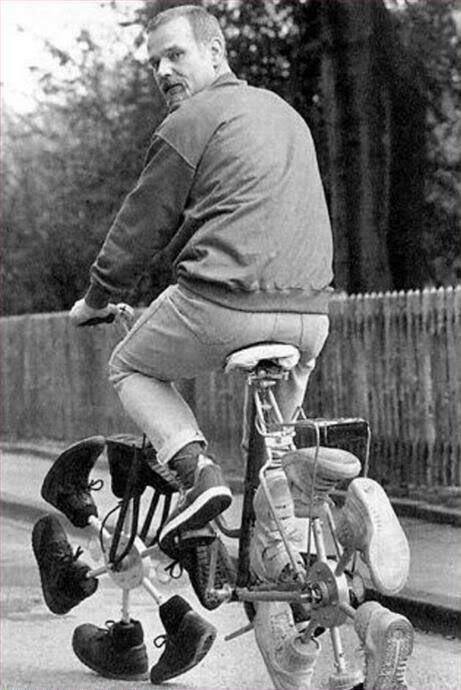 The feet would be wiped down with alcohol prior to the test. The wheel started, then traveled a bit and then lifted off the ground at a predetermined point. The wheel came back to ground at a distant point and continued to the end of its predetermined track. The Footstep trackers could follow the path of the wheel from the beginning to first lift point. Trailing dogs could not follow the path at all. A human decoy started walking beneath a modified ski lift and walked to point where he was lifted off the ground and carried in a straight line some distance down field to where he was dropped back on the ground and he continued to walk to a finishing point. The tracking dogs started at the beginning and tracked to the lift point but no further. The trailing dogs started and continued through the entire course and concluded at the end of the trail, thus following the human scent the entire distance. 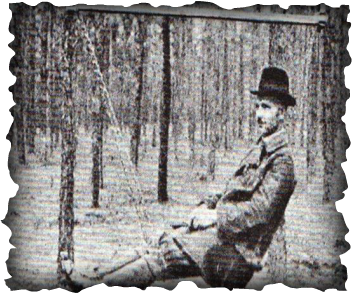 With this new breakthrough Conrad Most would go back to Germany and develop a new machine where he would be pulled along a wooden track course in a swing type harness (pictured above) and never let his feet touch the ground. He would mark his track starts with a scented glove and the end point with his other glove. A tradition that is still practiced in sport tracking. The two styles of tracking and trailing would continue to develop on their own to the present day. Tracking dogs are still looking for the next foot print while trailing dogs look for the human odor where ever they can find it. There seems to be a growing controversy over what is defined as tracking or trailing. From the historical perspective we need to go back to the Middle Ages and look at the usage of Rache or Limier Hounds. 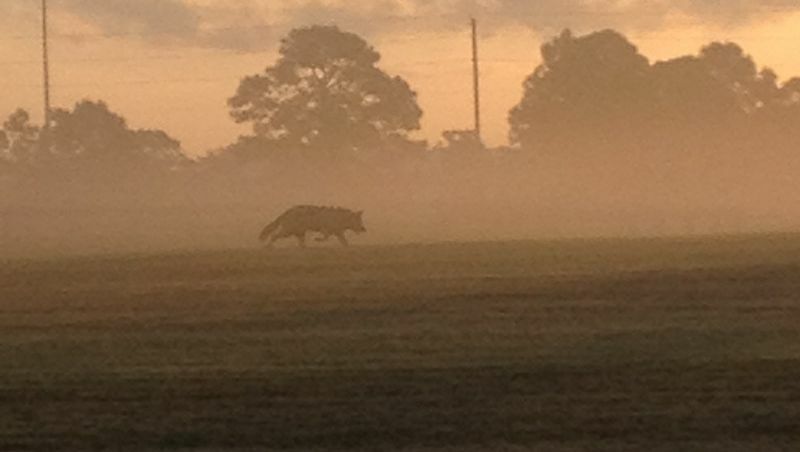 These hunting hounds were the forerunner of the Fox and Blood hounds. They were trained to follow a specific game trail usually by attaching the dead body of the desired game to a long line and then dragging it behind a willing helper. As the dogs ability was developed the training would change to stimulating the dogs prey drive by tying off the dog and allowing it to watch the prey "run away" then releasing the dog to pursue the game animal with the track terminating at the animal's death as it was shredded by the hunting dog or dog pack. The dog could hunt either in solo or the dogs were allowed to hunt in packs as it was believed this would enhance the intensity in the dog by stimulating inner pack competition. These training techniques continue today in one form or another. The Liver Drag method is still in use in the USA by many bloodhound and Police K9 Trainers. The techniques is basically the same of tying a piece of raw liver on a long line to a training partner and sending the training partner off through the woods. The dog (usually not fed for a few days) then tracks the victim to attain his food from the training partner at the termination of the track. The Run Away is still a very popular technique which involves the training partner having the dogs favorite toy with them. The training partner shows the toy to the dog and then "runs away" exciting the dog's desire to come and hunt them with the termination of the hunt finding the training partner and playing its reward game. The etymology of the word Trailing seems to be a purely English term as words of equivalent value are not found in French or Bavarian dialects in referring to tracking dogs. From the middle ages until the 1800's it appears that the usage of the word "trailing" described the position of the dog behind the game as the dogs were still referred to as a Tracking dog. To this day England has the only known Trailing Hound competitions held annually in Northern England or Ireland as listed in the Cumbrian Dog Sport registry. From the American perspective the term "Trailing" can date back to the Pilgrims who would let the dogs "trail' the blood trails left behind by wounded game. Here is where the word trailing refers to both the hunting behavior of the dog and also its position behind the wounded game. Of course if you are wanting to hunt wounded game by blood trails you need a hound for that purpose and this is where the Bloodhound makes it entrance. For the next hundred years the two words Bloodhound and Trailing come together and become almost inseparable and synonymous. As the Trailing dog developed they became known for the speed and endurance that they could trail their quarry and this is the reason that so many Trailing tests are 1-2 miles in length with a given time to make the completion of the track as opposed to most Tracking tests that are rarely more than 1/2 mile in length. The scenting ability of the dog was and still is judged by how old or age of the track, the trailing dog can work. Newer tracks have larger scent pictures while aged tracks represent smaller more challenging scent tracks. It is interesting to note that the usage of the tracking harness is not really mentioned until the late 1700's and it appears the tracking harness and long line was introduced in order to stop the dog from interacting with the game directly and saving the meat of the hunted game as opposed to allowing the dog to shred the game and destroy the edible parts. There are written stories of Confederate Slave owners using harnessed Bloodhounds to track runaway slaves in and around the Civil War period. Before this not much is known about the harness or its usage. From the Dog trainer or Behaviorist perspective, they are concerned with shaping a desired reliable behavior and here is where things can get complicated. In the simplest of terms we are training a dog to find and follow a specific scent trail. The Sport Tracking enthusiast (depending on what dog club they belong to) is teaching the dog to track ground disturbance odor (as mentioned above). The American Kennel Club offers Tracking Dog titles but the dog is pre-scented to an article used by the track layer and therefore is working by the Trailing dog definition held by most people but calls them Tracking dogs. For some Law Enforcement handlers, the dog is to track a non specific freshest Human Odor Track (HOT) which is presumed to be the criminals scent trail. From the behavior standpoint, they are all doing the same thing! The only change is what scent they are asked to follow. However depending on who you talk to there are many differences. For example most tracking dog trainers want a dog that tracks with his head down and nose to the ground as it searches for the target odor. If the dog raises its head they will say the dog is air scenting or trailing and not tracking. Some trainers will go to great lengths and put tremendous pressure on the tracking dog to NEVER raise its head while in track which has caused dogs NOT to indicate track loss creating a dog that is unreliable. However others define a track or trailing dog by how close the dog tracks to the original track line (see Figure 1 below). A dog that is IN the track lane is tracking while a fringe tracking dog is trailing. This shift in tracking behaviors by the dog led to an even newer term in dog training the "Track/Trail" dog. This newer term was really the result of trainers misunderstanding odor and what the odor was doing and how the dog was working the target odor. In reality the dogs were performing as they have been trained in the particular style, methodology and scent theory based on the beliefs and bias of their trainers. From the behaviorist standpoint there is no trailing, all dogs are just tracking. This appears to also be the case in the legal system since the trailing dog is not recognized in court proceedings at the time of this writing. Area Search dogs (aka Live find Air Scent dogs) are trained to enter a search sector (area) and search for any signs of human scent. They are normally deployed after the scent trail has been destroyed either by humans, bad weather conditions or if the Place Last Seen (PLS) is unknown. Whereas a trailing or tracking dog is started in an area of high probability (near the known PLS), an air scenting dog may be placed in a sector and used as a “clearing” mechanism to eliminate that particular area as negative. Area Search dogs can be either generic or scent specific. They can also indicate on evidence left in an area. In General, the dogs search areas until they come in contact with a scent pool or scent cone of the victim. Some are taught to ignore the ground scent trail that has been laid down by the victim. Based on weather and terrain considerations, the air scent canine will search an area and offer a measurable estimated probability of detection (POD) when in that sector . For further information on Probability of Detection, the Search Manager should read Hatch Graham’s Probability of Detection for Search Dogs or How Long is Your Shadow? *The POD charts are based on air scent capabilities and do not apply to trailing dogs. However, their interpretation of scent dispersal is of value for application to the trailing dog. Trailing/Tracking dogs have NO POD. SAR dogs have the ability to be trained in tracking, air scenting and cadaver. This cross training enhances the ability of the dog to find the human victim. The air scent dog is taught to ignore the victim’s scent trail, a cross-trained dog will find the trail and follow it to the victim. A tracking dog who is not cross trained to air scent will be useless in clearing an area unless we have a PLS to start from or the handler is casting the dog looking for scent trails during a hasty search. But a dog trained to do both can function in any given scenario. The dog that is trained also in Cadaver can be utilized in the recovery phase of a search should the circumstances require such. For more information on Cadaver dogs please click here . Make sure when requesting K9 support that you know what type of tracking dog you are getting. They should have a Certification from a Bona Fide organization and be properly maintained with a documented mission ready/operational status from the teams organization. Know what is the longest track that K9 can do and will that tracking dog find and alert on articles during its track! Know the oldest aged track the K9 team has worked successfully and what weather conditions they can perform in. Also whether the K9 will stay close to the track lane. If the K9 has been allowed to develop the habit of fringing (as many track/trailing dogs do), it will have a low probability of locating clues left behind by the lost person. If this is a FEMA related call out you will need to know if the team is a Type I or Type IV ( can stand alone for 72 hours or 24 hours during deployment) and if the team meets the current NIMS requirements. For Area Search K9 teams the Search Manager must know the certification that the team has and what Bona Fide Organization issued it since not all are the same. What is the largest sector they can work in 2 hours with the best POD? Most Law Enforcement K9 are certified in 10 acres or less, are rewarded with biting the decoy and are not comfortable in large wilderness areas, which makes them useless for large Wilderness Area Searches. Congruently USAR or Task Force K9's that are well trained Disaster K9 (Rubble Dogs) have NO place in large area wilderness searches and should be avoided since their training and certification would prove unreliable in a wilderness environment and could cause unintended legal entanglements. The Search Manager must be sure to ask if the Area Search K9 team is Type I or IV and if the Area Search K9 is scent specific or general human live find trained.